Begin your celebration of everything Gatsby on Monday, 10/3, 6:00-8:30 p.m. as Bloomingdale Public Library gets us all "On the Same Page" with a showing of "The Great Gatsby" starring Robert Redford and Mia Farrow. Drop-in, registration is not necessary, to enjoy this classic film (1974: MPAA rating: PG). "On the Same Page" is a month-long community read of F. Scott Fitzgerald's The Great Gatsby and a look at the life and culture of America in the 1920's. It is a cooperative program hosted by the public libraries of Bloomingdale, Itasca and Roselle. Check out the brochure for more information and a schedule of book discussions, movies, and programs at each Library. 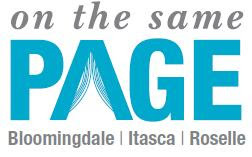 "On the Same Page" is sponsored by Bloomingdale Bank & Trust, Itasca Bank & Trust and Roselle Bank & Trust.